Erik Killmonger (right). Black Panther #37 (Aug. 2008). Cover art by Alan Davis and Mark Farmer. Erik Killmonger is a fictional supervillain appearing in American comic books published by Marvel Comics. Created by Don McGregor and Rich Buckler, the character first appeared in Jungle Action vol. 2, #6 (Sept. 1973). Killmonger, whose birth name is N'Jadaka, is an enemy of Black Panther. Michael B. Jordan portrays the character in the Marvel Cinematic Universe film Black Panther (2018). 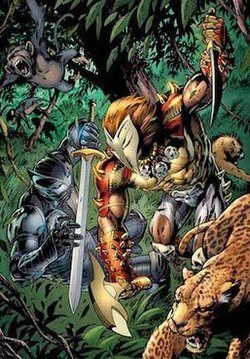 Erik Killmonger first appeared in the "Panther's Rage" storyline, initially in Jungle Action vol. 2, #6-8 (Sept. 1973 - Jan. 1974), and was created by writer Don McGregor and penciler Rich Buckler. The character subsequently appeared in Jungle Action vol. 2, #12-18 (Nov. 1974-Nov. 1975), Iron Man Annual #5 (1982), Over the Edge #6 (April 1996), Black Panther vol. 3, #13 (Dec. 1999), #15-16 (Feb.-March 2000), #18-21 (May-Aug. 2000), Deadpool #44 (Sept. 2000), Black Panther vol. 3, #23-25 (Oct.-Dec. 2000), #60 (July 2003), and Black Panther vol. 4, #35-38 (May-Sept. 2008). Erik Killmonger appeared in an entry in the 2006 reference book All-New Official Handbook of the Marvel Universe A-Z #6. He eventually contacted King T'Challa and was repatriated back to Wakanda, settling in a village that would later change its name to N'Jadaka Village in his honor. He became a subversive, with dreams of ridding Wakanda of what he termed "white colonialist" cultural influences and return it entirely to its ancient ways. [volume & issue needed] He then took advantage of the Black Panther's frequent absences in America with the Avengers to stage a coup d'état, along with Baron Macabre. [volume & issue needed] He was defeated and killed, until the Mandarin claimed his body. Using his rings, the Mandarin was able to amplify the Resurrection Altar and restore Killmonger to life. Killmonger returned to his lover and ally, Madam Slay, and the two plotted to kill the Black Panther and return Wakanda to its ancient ways. While Tony Stark visited Wakanda, Madam Slay drugged Jim Rhodes and took him prisoner. Killmonger appeared to have killed the Black Panther, and blamed Rhodes and Stark, convincing the Wakandans that he could lead them to vengeance. The Black Panther returned, revealing that he had faked his death using a Life Model Decoy. The Black Panther defeated Killmonger. The Mandarin recalled his ring, and Killmonger reverted to an inanimate skeleton. Killmonger's followers resurrected him again and he would clash with T'Challa on several other occasions. T'Challa is then once again the sole ruler of Wakanda when Killmonger resurfaces and takes control of the neighboring country of Niganda. During a subsequent duel with T'Challa, Killmonger is killed by Monica Rambeau, whom he had previously captured and imprisoned. Killmonger's young son is last seen swearing vengeance against the Black Panther, much like N'Jadaka had done years earlier after the death of his own father. Erik Killmonger is an expert martial artist with peak-level strength and a genius-level intellect. He is also an expert tactician. Erik Killmonger appears in Lego Marvel Super Heroes - Black Panther: Trouble in Wakanda, voiced by Keston John. Erik Killmonger appears in Marvel's Avengers: Black Panther's Quest, voiced again by Keston John. This version is the leader of the Shadow Council and T'Challa's teacher. In the two-part episode "Shadow of Atlantis", Killmonger hires Tiger Shark to break into the Wakandan Embassy to steal a jar containing a seal with the crest of the Wakandan Royal Family. After escaping with the seal with the Avengers pursuing him, Tiger Shark contacts Killmonger for an extraction only for Killmonger to turn him down upon failing to have his heist go off without a hitch. In the third episode "Into the Deep", Erik takes to the role of ambassador of Wakanda to the city of Atlantis and its king Attuma while secretly working to spring Tiger Shark from captivity. Revealing his true colors to both Attuma and Wakandan Royals T'Challa, who secretly snuck into the sunken city, and Shuri, who was invited as a diplomatic guest, Killmonger detonated Wakandan tech depthcharges which threatened to destroy Attuma's kingdom while the villains made their escape. Michael B. Jordan portrays Erik Killmonger in Black Panther (2018). This version is an American black-ops soldier named Erik Stevens but born N'Jadaka and earned his "Killmonger" nickname from his military actions. Rather than a Wakandan exile, he is rewritten as the son of Prince N'Jobu and an American woman from Oakland, California, and is also T'Challa's cousin. Also unlike the comics, his chest is covered with self-inflicted scarification dots, one for each of his confirmed kills. Seeking revenge for his father's death, and angry at Wakanda's refusal to assist disenfranchised black people around the globe, Killmonger challenges T'Challa for his birthright to the throne, and apparently defeats him. After becoming King he orders Wakanda's high-tech weapons be sent to marginalized groups in London, New York City and Hong Kong to help oppressed people rise up and overthrow the government. He wears a version of T'Challa's energy absorbing suit that, reminiscent of his comic book counterpart, has pronounced fangs and glows gold when being used. At the climax of the film, he is mortally wounded when T'Challa stabs him in the chest with a vibranium spear, dying after watching the sunset over Wakanda. He has a new costume in the film, different from the comic books. It bears a resemblance to Vegeta's costume from the Dragon Ball Z anime series, which the actor Michael B. Jordan is a fan of. Jordan said Killmonger's battle armor may have been inspired by Vegeta's battle armor. Erik Killmonger appears as a playable character in the Black Panther DLC pack for Lego Marvel's Avengers. Erik Killmonger appears as a playable character in Lego Marvel Super Heroes 2, voiced by Damian Lynch. He appears in the Black Panther DLC that had no connection to the movie. Erik Killmonger, as seen in the Black Panther depiction, appears as a playable character in Marvel: Future Fight. Erik Killmonger, as seen in the Black Panther depiction, appears as a playable character in Marvel: Contest of Champions. Erik Killmonger is referenced in the song "King's Dead" by rappers Jay Rock, Kendrick Lamar and Future, from the 2018 film's soundtrack. ^ "Marvel.com - The Official Site for Marvel Movies, Characters, Comics, TV". Marvel.com. ^ "Into the Deep". Avengers Assemble. Season 5. Episode 3. September 30, 2018. Disney XD. ^ "SDCC 2016: Marvel's 'Black Panther' Confirms Additional Cast | News | Marvel.com". marvel.com. Retrieved 2016-07-24. ^ MTV (24 July 2016). "Michael B. Jordan Talks About Becoming a Bad Guy - Comic Con 2016 - MTV" – via YouTube. ^ "Killmonger". Marvel. Retrieved May 1, 2018. ^ Medina, Joseph Jammer (January 2, 2018). "Black Panther Bios Hit The Web". LRMOnline.com. Retrieved January 2, 2018. ^ "Black Panther's Killmonger May Have Borrowed His Costume From Vegeta". Comic Book Resources. 22 February 2018. ^ "Michael B. Jordan's Killmonger Costume Honors His Anime Love". Screen Rant. 21 February 2018. ^ "'Black Panther's Michael B. Jordan Says Killmonger's Armor May Be Based on Vegeta From 'Dragon Ball Z'". ComicBook.com. November 25, 2018. ^ Paget, Mat (March 17, 2016). "Lego Avengers DLC Season Pass Detailed". Gamespot. ^ Dornbush, Jonathon (13 February 2018). "LEGO Marvel Super Heroes 2 Black Panther DLC Revealed". IGN. Retrieved 21 April 2018. ^ "The King of Wakanda Rules Marvel Games". Marvel. ^ "Champion Spotlight – Killmonger". Contest of Champions official website. Retrieved February 16, 2018. "Digital Priest: Killmonger". Archived from the original on October 13, 2007. This page was last edited on 23 February 2019, at 10:01 (UTC).